Since 2004, CAWI has provided Women’s Civic Participation Training where a total of 150 women have learned how city government works and how to bring their views forward. And of those, about 80% shared their views for the first time. 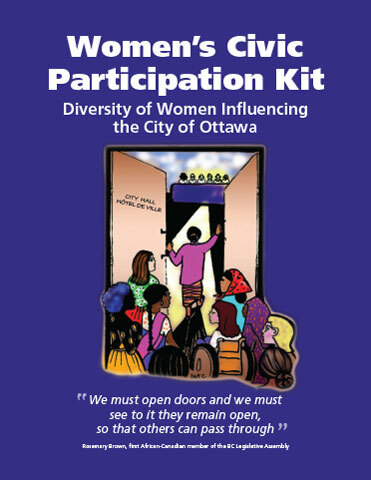 This 9 month training program consists of 4 – 5 full day workshops and working in Action Teams to apply their learning in the municipal election, city budget process and on issues of concern arising at City Hall.Women listen to the concerns of their communities, and bring those concerns forward to their Councillor through e-mails, phone calls, meeting with Councillors and presenting deputations. Currently, CAWI provides this training to women in selected neighbourhoods, who form Neighbourhood Action Teams, so as to engage their neighbours in city issues. Participants are from communities whose voices are least likely to be heard at City Hall – women who are living on low-income, Aboriginal, francophone, immigrant, racialized and living with a disability. Each team is mentored by a community developer from one of the 14 centres in the Coalition of Community Health and Resource Centres. The Civic Participation Kit provides easy-to-read information on how to bring your views forward to city decision makers. Our Views Matter brochure, which gives an even shorter overview, is available in six languages to distribute in your community.